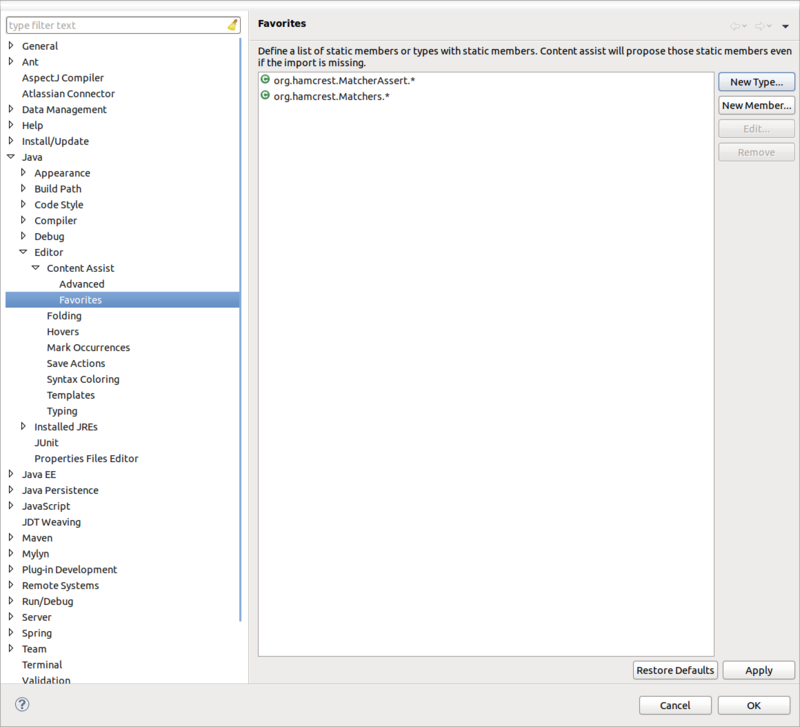 If you’re using Eclipse and working with a class with a lot of static members, you might be affected by the problem of lack of content assist and automatic import for such members. Let’s say you’re using a Hamcrest matchers; you need a is(), notNullValue(), hasEntry() and so on (there are plenty of those). You don’t want to type Matchers.hasEntry() every time you use it in your code. Hey, that’s not why the fluent API was invented in the first place! Later on, if you want to use another matcher, e.g. notNullValue() you need once again type the import statement by yourself. That’s ugly, time waste manufacture which we should get rid off! Luckily, there is an Eclipse setting which allows you to add some specific static members or whole types into the regular content assist (ctrl + space) without writing any import statement by yourself.